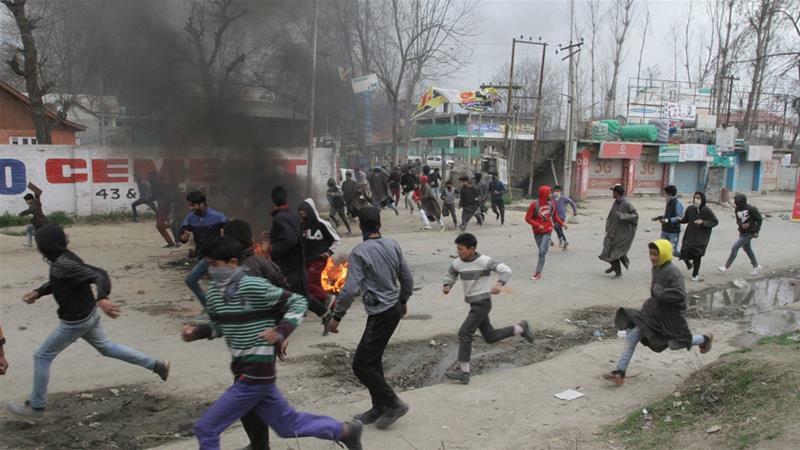 Hundreds of protesters clashed with Indian security forces in parts of Indian-administered Kashmir after police said a man detained over a security investigation died in police custody. Rizwan Asad Pandit, a 29-year-old chemistry teacher, was arrested as part of “terror case investigation”, the police said in a statement on Tuesday. “The person died in police custody,” the police said, adding an investigation into the cause of his death was under way. Pandit’s family condemned his death as a “cold-blooded murder” as crowds gathered in the southern Pulwama district in protest. Security forces fired tear gas at protesters as authorities suspended internet services in the region. Mubashir Asad, Pandit’s brother, said police arrested Pandit at his home in the Awantipora village late on Sunday night. “They said he would be released soon. My brother was not involved in anything. This is a cold-blooded murder,” he said. India also banned the Jamaat-e-Islami (JeI) political party in Kashmir and arrested some 300 of the group’s leaders and activists. A senior police official, speaking on the condition of anonymity, said Rizwan was detained over the Pulwama attack. “We had some information that he knew how to make explosives and suspected his role in the recent attack,” the official said. Following Rizwan’s death, separatist leaders in Indian-administered Kashmir called for a shutdown in the region. Mirwaiz Umar Farooq, chairman of the separatist umbrella All Parties Hurriyat Conference, denounced Rizwan’s death in a post on Twitter, saying: “The brutal killing once again exposes the helplessness, vulnerability, and insecurity to the lives of Kashmiris as the impunity of the authorities keeps rising,” he said. While custodial deaths have not been common in recent years, Rizwan’s death “adds to the more than 70,000 killings, more than 8,000 enforced disappearances, as well as thousands of torture and sexual violence cases” in Indian-administered Kashmir over the past three decades, he said.